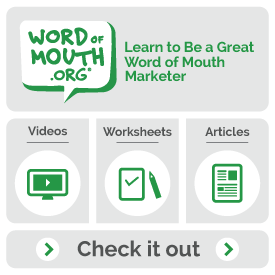 5 of the biggest concepts in word of mouth | Andy Sernovitz | Damn, I Wish I'd Thought of That! We don’t talk about average products sold by boring companies with mediocre customer service. If this is your strategy — trying to be “good enough” — you need a new strategy. Instead, make something fantastic — and then make it stretchy, purple, humongous, or hilarious. Be remarkable. Be fantastic. Be worth talking about. If you fail to be interesting, customers aren’t going to talk about you. Instead, you’ll have to pay newspapers, TV shows, radio stations, and websites to do it. Sure, there are brands who do this. But it’s expensive, and it’s getting harder and harder to pull off every day. It’s also a lot less fun. An angry customer will tell five people about their experience, but a formerly angry customer made happy again will talk to ten. Finding a way to make upset people happy is worth twice as much word of mouth than making them happy in the first place. It’s silly that most customer service is so bad that when people are treated well, they’re so surprised they run around telling everyone. But it’s a great opportunity for you. You are not what your ads, press releases, or brand statements say. You are what people say about you. You are the sum total of what people do and feel when interacting with your stuff. You are the user experience. What looks good on a spreadsheet often translates to a real-world word of mouth disaster. Take low-cost customer service, for example. Lots of companies try to save a buck or two here or there. The result? Terrible customer experiences and a whole lot of terrible buzz. Always factor in the word of mouth math, and always remember that no spreadsheet can tell you when you’re being a jerk.